United States Navy, and a 1985 graduate of Reading Area Community College. 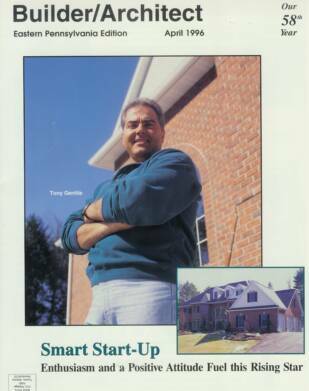 Tony started building homes in 1987. His company and a few of his projects were featured in Builder/Architect Magazine of April 1996. Gentile Homes is a Berks County Home Builders Association member and Parade Of Homes winner in every category and receiving the Best of Show award in 1996. Each client receives one-on-one attention through the entire process from design planning to settlement day. Creativity is achieved through a combination of our architectural ideas, as well as the input obtained through brainstorming sessions with the client. The style of our homes are as unique as our clients. Expect style and class that will not fade with the ages. results. Your project is our project.